John Ronald Reuel Tolkien is a favorite author of New Left “hippies” and New Right nationalists, and for pretty much the same reasons. Tolkien deeply distrusted modernization and industrialization, which replace organic reciprocity between man and nature with technological dominion of man over nature, a relationship that deforms and devalues both poles. 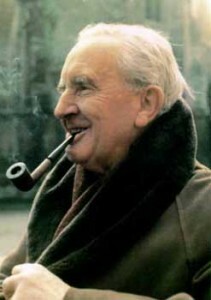 But philosophically and politically, Tolkien was much closer to the New Right than the New Left. Tolkien was a conservative and a race realist. His preferences ran toward non-constitutional monarchy in the capital and de facto anarchy in the provinces, but he recognized that state control can be minimized only in a society with a deep reverence for tradition and a high regard for individual honor and self-restraint. Many of Tolkien’s most fervent New Right admirers are neo-pagans. But Tolkien himself was a devout Roman Catholic traditionalist, albeit one with a deep love of pre-Christian myth, epic, and tradition. And although The Hobbit and The Lord of the Rings, with their many themes from Norse and Celtic mythology, resonate especially with pagans, the ultimate mythological framework of Middle Earth, particularly as expressed in the posthumous work The Silmarillion, is biblical in inspiration, with a creator God (Eru Ilúvatar), a devil (Melkor), a fall, and even a hint of the necessity of a divine incarnation to save creation. For more background on Tolkien’s life and work, I recommend two introductory books, which are accessible even to teenagers: Leslie Ellen Jones’ Myth and Middle-Earth: Exploring the Medieval Legends Behind J. R. R. Tolkien’s Lord of the Rings and Bradley Birzer’s J. R. R. Tolkien’s Sanctifying Myth: Understanding Middle-Earth. The most thorough and serious biography and overall interpretation of Tolkien is Joseph Pearce’s Tolkien: Man and Myth. For those who need no introduction, there is no better commemoration than to spend a winter evening snug in one’s own Hobbit hole reading the works of the man himself (or watching Peter Jackson’s masterful and inspiring movies of The Lord of the Rings). Published: January 3, 2014 | This entry was posted in North American New Right and tagged articles, commemorations, Greg Johnson, J. R. R. Tolkien, literature, North American New Right, originals, The Hobbit, The Lord of the Rings. Both comments and trackbacks are currently closed. Tolkien vocally opposed Adolf Hitler and the Nazi Party prior to the Second World War, and was known to especially despise Nazi racist and anti-Semitic ideology. In 1938, the publishing house Rütten & Loening Verlag was preparing to release The Hobbit in Nazi Germany. To Tolkien’s outrage, he was asked beforehand whether he was of Aryan origin. In a letter to his British publisher Stanley Unwin, he condemned Nazi “race-doctrine” as “wholly pernicious and unscientific”. He added that he had many Jewish friends and was considering “letting a German translation go hang”. Yes, Tolkien was a pious, pompous fool, the kind of patriot who paved the way for the submergence of England under a tide of Third World mud. But I still admire his art. LOTRs is a pro-White epic. I must say however that I didn’t find the 1st Hobbit movie to be even close to the LOTRs movies. The Matrix was the anti-White epic. I re-read Trevor Lynch’s movie reviews of the Lord of the Rings series. I recall that the 3rd movie won a record number of Academy Awards (actually tied with a couple of other movies – Ben Hur and Titanic). I remember watching Steven Speilberg handing the Best Picture award to Peter Jackson, remarking that the Return of the King has won all the Oscars it was nominated for. “A sweep”. I was curious to know the make up of the Academy Award membership – according to wiki, there’s over 5800+ members – their vote decides winners. Many of the members work in the film industry in various fields, and actors – over 1,300 of them – is about 22% of the voting bloc. Wiki reveals the demographics of the Academy Award membership – “Of the 5,100+ active voters confirmed, 94% were Caucasian, 77% were male, and 54% were found to be over the age of 60. 33% of voting members are former nominees (14%) and winners (19%).” Now, don’t you wonder how much of the “94% Caucasian” members are jews? I bring this up as supposedly the jews dominate the film industry and yet the Academy Award membership gave out 11 Oscars to The Return of the King – a very Gentile film! When I saw “The Return of the King” in the cinema in 2003, Aragorn toasted his companions with the words “Hail to Victory”. We all know how those words translate into German. On the several occasions that I have watched the film since 2003, including the extended DVD version, the words were omitted. Comparing the two, I find The Lord of the Rings was easier to read and follow than The Hobbit. “J. R. R. Tolkien: Author of the Century” by Tom Shippey is one of my favorite books on his works. It undoubtedly inspired in me a greater appreciation of the uniqueness of European culture.